“Plant of the Week” is part of a series of fact sheets I did for a horticulture class I took at Oregon State University on herbaceous perennials (HORT 255). I thought others might also be interested and we could have a discussion on our experiences with some of these plants. I’ve also started adding some of my favorite plants. Note: this is not edible ginger, which is Zingiber officinale. 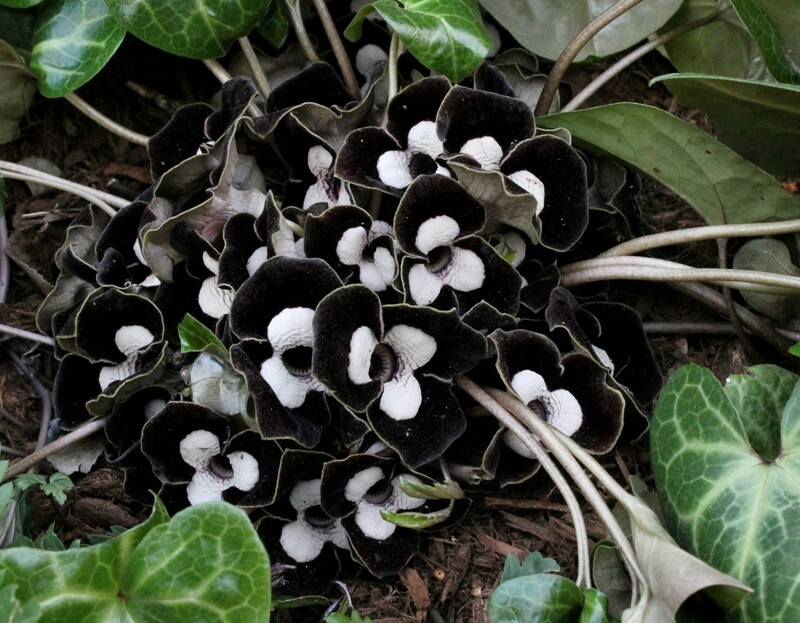 CULTURE: Asarum contains about 70 species, most of which are native to north temperate areas. The common name comes from the ginger-like smell that arises from the roots when bruised or cut. All 70+ species prefer woodland conditions of slightly acid soils, heavy shade, constant moisture and good drainage. In the wild, plants generally occur in the dappled shade of deciduous forests. In the garden, they are used mainly as shade-tolerant ground covers whose glossy green leaves, often mottled with white or yellow, are amazingly eye-catching for such diminutive plants. The urn-shaped flowers consist of sepals only and are borne underneath the foliage. Perennials like Asarum, Bergenia, Helleborus, and Heuchera need to have their dead leaves removed, particularly if they have been exposed to windburn or sunscald. Native Americans and early Euro-American settlers have used wild ginger as a spice. The root is harvested dried and then ground into a powder. Early settlers also cooked pieces of the root in sugar water for several days to obtain a ginger-flavored, candied root. The left over liquid was then boiled down to syrup that was used on pancakes and other food items. Note though: scientists have determined that the plants may contain poisonous compounds and consumption of the plant is highly discouraged. DiSabato-Aust, Tracy (2006-07-24). The Well-Tended Perennial Garden: Planting & Pruning Techniques (Kindle Location 4273). Timber Press.